Two distinguished former NASA astronauts -- Shannon Lucid and Jerry Ross -- will be inducted into the U.S. Astronaut Hall of Fame as the 2014 class, officials announced Friday. Lucid, the only American woman to serve aboard the Russian space station Mir, and Ross is the first human to complete seven space shuttle missions. Their selection as the 2014 inductees was announced today at the new Space Shuttle Atlantis attraction at Kennedy Space Center Visitor Complex by Dan Brandenstein, chairman of the Astronaut Scholarship Foundation and himself a four-time shuttle astronaut and Hall of Fame member. Lucid and Ross will be inducted into the Astronaut Hall of Fame at 3 p.m. May 3 during a ceremony at the Visitor Complex, joining the ranks of well-known space explorers such as Alan Shepard, John Glenn, John Young, Neil Armstrong and Sally Ride. "Shannon Lucid and Jerry Ross are extraordinary astronauts who made history as very important and frequent crewmembers in shuttle missions," Brandenstein said. "We are looking forward to honoring their accomplishments and sharing their tremendous life stories at the May 3 induction." Lucid and Ross were selected by NASA to become astronauts within two years of each other; Lucid in 1978 and Ross in 1980. 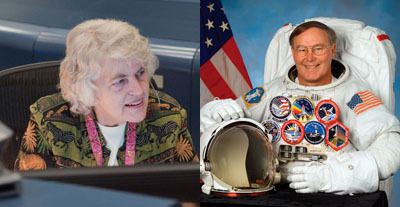 Now retired, both achieved honorable milestones throughout their careers with NASA. Lucid joined the first U.S. astronaut class to include women and held the record until 2007 for the most flight hours in orbit by a female astronaut (5,354 hours, or 223 days). Ross was the first to break the world record for being the first human launched into space seven times. Past inductees were part of the Mercury, Gemini, Apollo, Skylab and Space Shuttle programs. Welcoming Lucid and Ross marks the thirteenth group of space shuttle astronauts named to the Astronaut Hall of Fame. The addition of these two accomplished astronauts brings the total number of members to 87. In 2013, space shuttle astronauts Curt Brown, Eileen Collins and Bonnie Dunbar were inducted. Shannon Lucid, a Ph.D., is a veteran of five space flights. She boarded space shuttle Discovery on June 17, 1985, for her first mission, STS-51G. On this mission, the crew deployed and retrieved the Spartan satellite along with several other communication satellites. On March 22, 1996, Lucid launched aboard STS-76 Atlantis toward the Russian Space Station Mir. She spent 188 days working as Board Engineer 2 on life and physical science experiments. Lucid is the only American woman to have served on the Mir. President Clinton presented Lucid with the Congressional Space Medal of Honor in December 1996 for her mission to Mir, making her the first woman to receive this award. Lucid's other missions include STS-34 Atlantis, STS-43 Atlantis and STS-58 Columbia. After serving on Mir, Lucid became NASA's Chief Scientist at NASA headquarters in Washington D.C. She then went on to serve as a CAPCOM in Mission Control, helping her fellow astronauts in space. Lucid retired from NASA in January 2012. Jerry Ross, a retired United States Air Force colonel, entered active duty with the Air Force in 1972 and became a payload officer/flight controller at the Lyndon B. Johnson Space Center in 1979. Ross flew as a mission specialist for six of his record-holding seven flights to space and logged 1,393 hours in space, including 58 hours, 18 minutes during nine spacewalks. Ross spent a considerable amount of time between 1998 and 2002 working on the International Space Station (ISS). Endeavour launched the first ISS assembly mission, STS-88, on Dec. 4, 1998. It was a 12-day mission during which Ross completed three spacewalks and aided in connecting umbilicals between the U.S. Unity module and the unmanned Russian Zarya module. Five of Ross's seven flights were flown on space shuttle Atlantis. In between his first launch into space on Nov. 26, 1986, aboard STS-61B Atlantis, and his last on April 8, 2002, with STS-110 Atlantis, he also flew on STS-27 Atlantis, STS-37 Atlantis, STS-55 Columbia and STS-74 Atlantis. Throughout his career, Ross received 15 NASA medals and was awarded the American Astronautical Society's Victor A. Prather Award for his numerous spacewalking achievements. From 2003 until his retirement from NASA in January 2012, Ross served as chief of the Vehicle Integration Test Office at Johnson Space Center. "Spacewalker: My Journey in Space and Faith as NASA's Record-Setting Frequent Flyer" is Ross' recently published autobiography.